Reggie was born in Guyana and now resides in South Florida. He has performed all over the Caribbean and is currently appearing at many Florida Keys resorts. Although Reggie plays many popular songs you will find his style very unique and his presentation of Reggae, Calypso and Latin music very relaxing. Experience the natural beauty and the warmth of the Caribbean people with Reggie Paul's Island Party - a rich expression of that culture. Hear the a unique blending of African, European, and Latin-American flavors which represent the folklore of the Caribbean people. 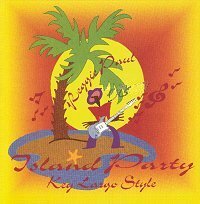 Island Party is a compilation of Caribbean Folklore and selected favourites.